Learn more and have your say on how the Games could impact our city. Online and in-person engagement for the Olympic and Paralympic Winter Games Bid is now closed. In-person and online engagement activities took place between October 2-28. Below you will find a report-back on everything that was heard in this engagement. This document contains all input received online, between October 2 and October 28, 2018. This document contains input received in person, between October 2 and October 28, 2018. This page is also available as plain-text for participants using screen readers or in graphic format. Calgarians are being asked to consider whether or not Calgary should host the 2026 Olympic and Paralympic Winter Games (the Games). The idea began in 2016 when The Calgary Sport Tourism Authority (CSTA) recommended The City explore a bid to host the Games. The CSTA felt there were considerable benefits of bidding for and hosting the Games. It also saw the potential that the Games could align closely with The City’s long-term goals around economic opportunity, sport development, social development, and cultural enrichment. As a result, City Council funded the Calgary Bid Exploration Committee (CBEC) to determine whether a bid would be feasible. Based on CBEC’s work, The City of Calgary, Province of Alberta and Government of Canada, funded a Bid Corporation, called Calgary 2026. Calgary 2026 then developed and presented its Draft Hosting Plan Concept (draft hosting plan) to City Council. 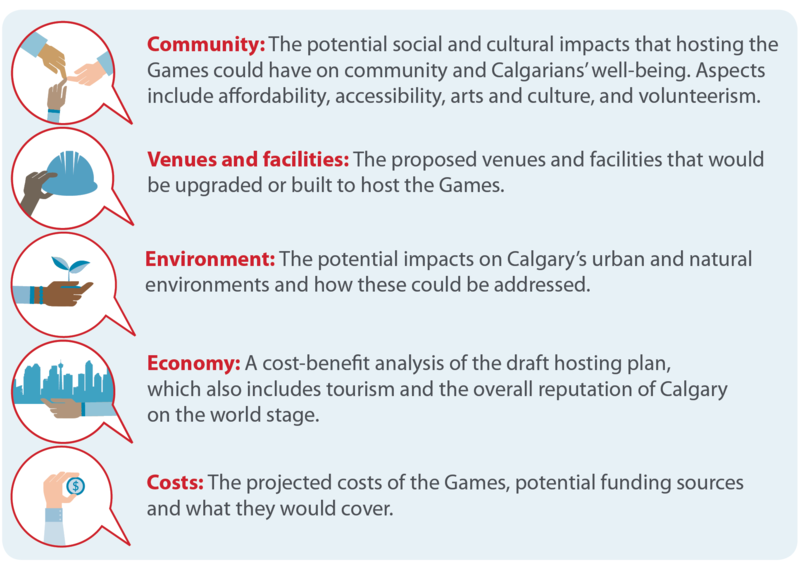 The draft hosting plan is a proposed approach that includes projected costs and infrastructure required for Calgary to host the Games. To support City Council in its consideration of the draft hosting plan, The City was directed to undertake an analysis of the draft hosting plan and a potential bid. As part of its process in considering whether or not to submit a bid, City Council wants to engage with Calgarians to understand their views on this guiding question: Will hosting the Games help or hinder Calgary's future? We've created five topics of conversation to structure the information we share and the questions we ask in this engagement program. City Council will consider a range of information before making its decision. 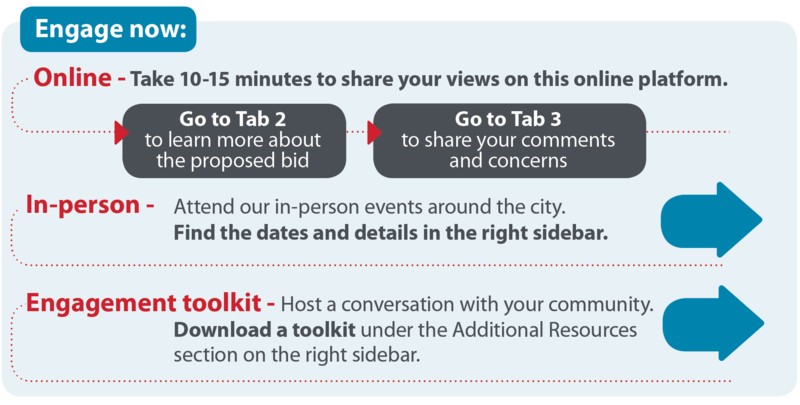 Go to the platform's tab 2 to learn more and go to tab 3 to help City Council understand what you see as the key issues, concerns and opportunities of the potential bid. Please take 10-15 minutes to learn more and provide your input by using the tabs at the top of the page . The City has analyzed the Draft Hosting Plan Concept (draft hosting plan) prepared by Calgary 2026, and wants to share balanced and neutral information with you. Go through the drop-down questions below to find key information, benefits and risks of potentially hosting the Games grouped by the topics of conversation. Check back for new and updated information as we learn more. These topics are based on the results from the 2018 Citizen Perspectives Survey Report released in August, including the specific information Calgarians wanted to know about the potential bid for the 2026 Olympic and Paralympic Winter Games. Topic summary documents can also be downloaded from the Additional Resources section in the right sidebar. When we think about community, we mean building an inclusive, safe, accessible, inspiring, healthy and prosperous community for all citizens. What is being proposed for housing? How is accessibility being considered in the draft hosting plan? The draft hosting plan includes venue designs to make it easier for people of all abilities to enter, leave and move around. Upgrades to the Games venues would make them more accessible. The Paralympic Winter Games also promotes an inclusive community by creating awareness about the importance of accessibility for all Calgarians. How will the Games impact our city's arts and culture? The draft hosting plan includes many cultural activities. All Olympic and Paralympic Games must feature a Cultural Olympiad, which would begin a few years before the Games and may include cultural events throughout the city, province and country. Planned live sites could have cultural elements that are free and affordable. These events could include large screens for people to watch live coverage of the Games, entertainment stages with artists, as well as recreational, cultural and community activities. Local and national talent would be featured. How could the Games affect volunteerism? The draft hosting plan describes ways to increase volunteerism and community spirit, by bringing people together around a common goal. The Games will require thousands of volunteers, including potential volunteers from underrepresented groups like new Canadians, youth, cultural communities and Indigenous communities. The Games have the potential to inspire a new generation of volunteers across Calgary. In the past, our community spirit has been highlighted through a number of events including the 1988 Games, Grey Cup Finals, and recovering from the 2013 flood. What are the potential benefits for communities? What are the potential risks for communities? How does the draft hosting plan align with City priorities? The City is reviewing the draft hosting plan to see how well it fits with Citizen Priorities, Council Directives, City policies, strategies and long-term capital and financial plans. We want to see if the Games match with our views of a community and whether they will help us achieve our vision for Calgary as a great place to make a living, a great place to make a life. Our common purpose is: Making life better every day. The Council Directives directly linked to this topic are: A city of inspiring neighbourhoods, A healthy and green city, and A prosperous city. Ready to engage? Please provide your input in the Step 3 tab at the top of the page. This information explores the venues and facilities proposed in Calgary 2026’s Draft Hosting Plan Concept that would be upgraded and built to host the Games. Which existing venues would be used for the Games? Would new venues be needed for the Games? During the Games, the proposed 5,000-seat, two-ice sheet arena would host some hockey games, the para-hockey games and training. After the Games, the proposed arena would host regional, provincial and national competitions. It would also be used by athletes and the community for training, competition and recreation, giving Calgary two new ice sheets. What are the potential benefits for Calgarians in investing in new and existing venues? What are the potential risks for Calgarians in investing in new and existing venues? Where would athletes stay during the Games? During the Olympic Games, 4,900 athletes and team officials would stay in Calgary, Canmore, Kananaskis and Whistler. The draft hosting plan proposes that a majority of Olympic athletes would stay in Calgary. The majority of Paralympic athletes would stay in Canmore, with remaining athletes staying in Calgary. Where would the spectators stay? Friends, family and vacation rental sites have housed spectators and tourists for past Games and can potentially be used in 2026 as well. The City is reviewing the draft hosting plan to see how well it fits with Citizen Priorities, Council Directives, City policies, strategies and our long-term capital and financial plans. The Council Directives directly linked to this topic are:A healthy and green city and A prosperous city. Environmental sustainability is a priority for City Council and The City of Calgary, and addressed in Calgary 2026’s Draft Hosting Plan Concept. Environmental sustainability is about actions to keep our communities, air, water and land healthy today and for the future. How is environmental stewardship being considered in the draft hosting plan? What are the potential environmental benefits of hosting the Games? What are the potential environmental risks of hosting the Games? The City has reviewed the draft hosting plan and it is in line with its Environmental Policy and Climate Resilience strategy. The Council Directives directly linked to this topic are: A healthy and green city and A well-run city. This information explores a cost-benefit analysis, which also includes tourism and the overall reputation of Calgary on the world stage. How is Calgary's economy being considered within the context of hosting the Games? The City of Calgary has commissioned a cost-benefit analysis of the draft hosting plan. Information from this report will be made public mid-October. What are the potential economic benefits for Calgary? What are the potential economic risks for Calgary? The Council Directives directly linked to this topic are: A well-run city and A prosperous city. 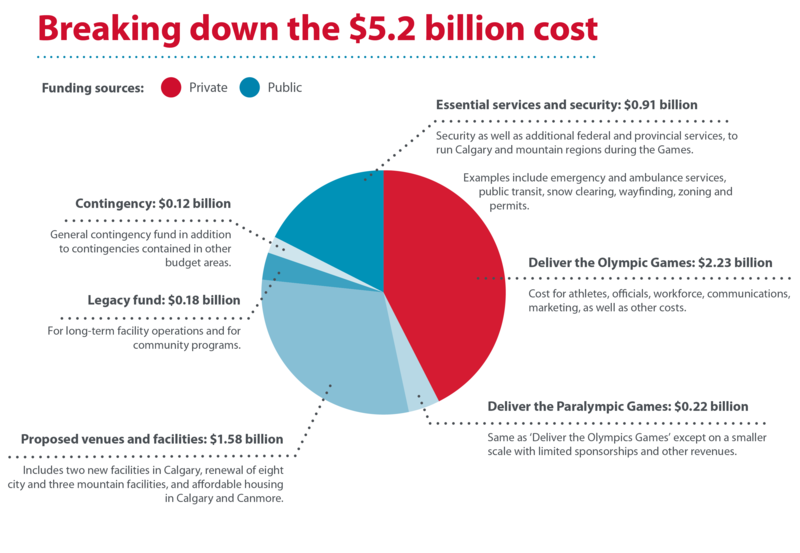 How much will Calgary have to pay to host the Games? The City is currently negotiating a cost sharing agreement with the Government of Alberta and Government of Canada. More information about sharing costs with other orders of government will be released once it is available. What are the costs of hosting the Games? How are the costs of hosting the Games being considered? The City is reviewing the draft hosting plan to see how well it fits with Citizen Priorities, Council Directives, City policies, strategies and our long-term capital and financial plans. We are reviewing if the Games provide an opportunity to achieve Council goals or if the Games would pose a challenge that may deter and/or delay achieving those goals. The Council Directive directly linked to this topic is: A well-run city. What are the benefits when it comes to the cost of the Games? What are the risks when it comes to the cost of hosting the Games? The Games are eight years away. Events can occur that result in changes to costs. The City is reviewing the proposed draft hosting plan to see how well it fits with Citizen Priorities, Council Directives, City policies, strategies and our long-term capital and financial plans. The Calgary Sport Tourism Authority (CSTA) recommended in 2016 that The City explore a bid to host the Games. The CSTA felt there were benefits of bidding for and hosting the Games. It also saw the potential that the Games could align closely to The City’s long-term goals around economic development, sport development, social development, and cultural enrichment. As a result, City Council funded the Calgary Bid Exploration Committee (CBEC) to determine feasibility of a bid. As a result, The City of Calgary, Province of Alberta and Government of Canada funded a Bid Corporation, called Calgary 2026. Calgary 2026 developed and presented its Draft Hosting Plan Concept to City Council. The City has provided City Council and the 2026 Olympic and Paralympic Winter Games Assessment Committee with regular updates. The City continues to analyze this draft hosting plan and the opportunities, benefits, costs and risks of a potential bid. The City Secretariat presented a report to City Council in September with its analysis of the draft hosting plan. Who is involved in the bid decision and how does feedback fit in the decision-making process? Refer to this infographic to see who is involved and how your feedback fits in the decision-making process. What are the proposed Olympic and Paralympic numbers in the Calgary 2026 hosting plan? Refer to this infographic to see the proposed Olympic and Paralympic numbers in the draft hosting plan. Your feedback is vital. When you feel ready, please provide your input in the Step 3 tab at the top of the page. Through this engagement program, we are seeking your input on this guiding question: Will hosting the Games help or hinder Calgary's future? This information will help City Council understand what Calgarians see as the key issues, concerns and opportunities of the potential bid. Your feedback is vital to helping City Council decide whether or not to submit a bid to host the 2026 Olympic and Paralympic Winter Games. Please take 10 - 15 minutes to have your say in our questions below. Q1. Do you think Calgary should submit a bid for the Games? I want The City of Calgary to submit a bid to host the 2026 Olympic and Paralympic Winter Games. Please reload this page to see the poll results. Q2. 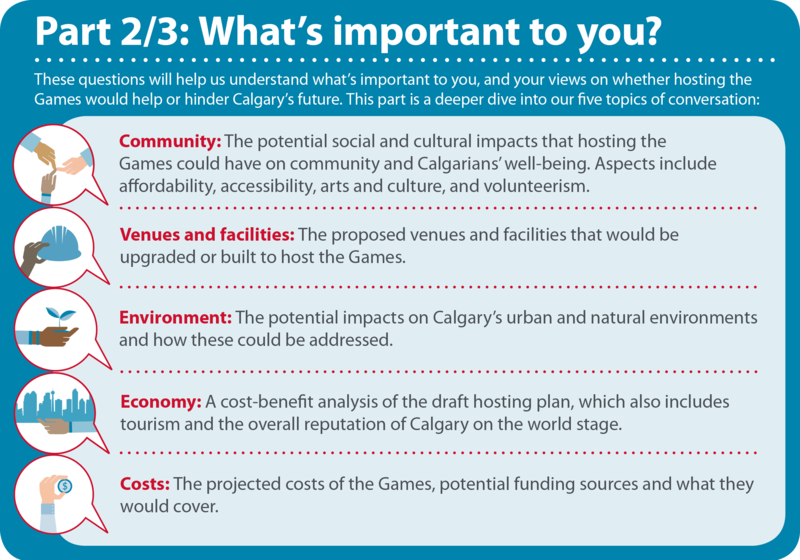 What do you see as the top benefit or risk from Calgary hosting the Games? We’re interested in understanding why you think our city should or should not submit a bid for the Games, including reasons that are outside of the five topics of conversation. These topics are high-level categories of Calgarians' comments, concerns and interests we heard in the 2018 Citizen Perspectives Survey results released in August. The survey was commissioned by The City to gain a baseline understanding of citizens' attitudes and perceptions towards a potential bid for the 2026 Olympic and Paralympic Winter Games. Q1. When it comes to Calgary hosting the Games, what is important to you? Please rank how important you feel each topic should be in The City’s consideration of whether or not to submit a bid. Drag the topics from the box on the left to the box on the right, placing the most important at the top and least important at the bottom. Q2. COMMUNITY: Do you think the potential social and cultural impacts of the Games would help or hinder Calgary's future? Why or why not? Share your thoughts in the textbox below or skip to the next topic. Q3. VENUES AND FACILITIES: Do you think the proposed upgraded and new venues and facilities from the Games would help or hinder Calgary's future? Why or why not? Q4. ENVIRONMENT: Do you think the potential environmental impacts from the Games would help or hinder Calgary's future? Why or why not? Q5. ECONOMY: Do you think the potential economic impact of the Games would help or hinder Calgary's future? Why or why not? Q6. COSTS: Do you view the long-term impacts of the Games as being worth the costs? Why or why not? Share your thoughts in the textbox below or skip to the next question. Please self-identify as you feel comfortable. Q5. What is your total household income? This information helps to ensure we're hearing from a representative range of participants. Q7. To help The City understand the views represented in this engagement program and target outreach efforts, we ask for the following information. Thank you for your time and valued input! For more information, resources and related reports, go to The City of Calgary's website on the 2026 Olympic and Paralympic Winter Games. All events are now complete. Thank you to everyone that participated. The City is hosting a number of events to gather Calgarians’ input on a proposed bid to host the 2026 Olympic and Paralympic Winter Games. Pop-up events allow people to get general information about the proposed bid, offer input and find out where they can learn more. They are intended for quick conversations in locations where Calgarians live, work and play. Open houses allow people to explore information displays at their leisure and speak with City staff about the proposal to bid for the 2026 Games. They offer multiple ways for people to offer input - face-to-face, written submissions and online. 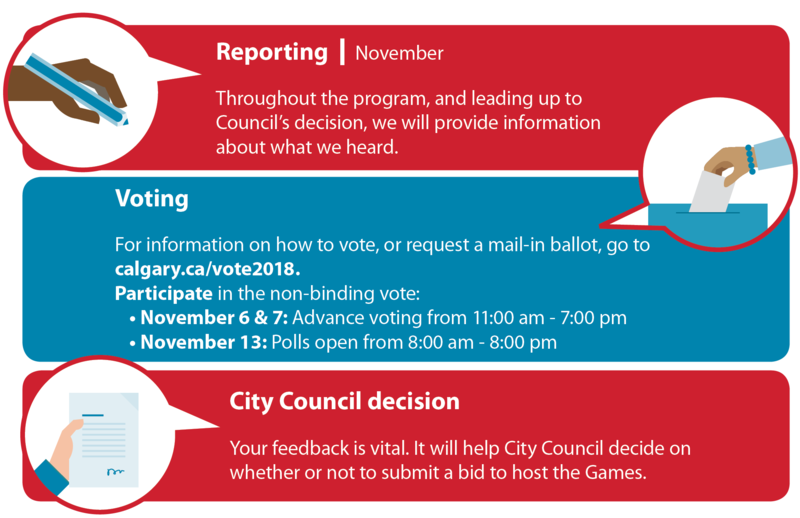 As part of its process in considering whether or not to submit a bid, City Council wants to engage with Calgarians from October 2 to 28 to understand their views on this guiding question: Will hosting the Games help or hinder Calgary's future? Throughout the program, and leading up to Council's decision, we will provide information about what we heard. Your feedback is vital. It will help City Council decide whether or not to proceed with a bid to host the Games.